Could your house use new siding? Over the course of time, the exterior of your home is gradually degraded by the sun and other elements such as inclement weather conditions. These exposures result in fading, stained and potentially damaged siding. Griffith Exteriors can provide you with the highest quality siding and workmanship that is long lasting and resilient. 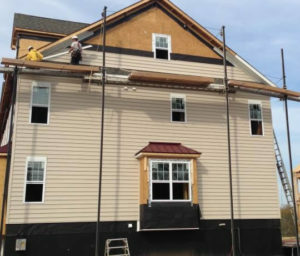 We use only the best available resources for our siding customers, and we will work with you to determine what material will best fit your home! Let Griffith Exteriors add beauty and value to your home with our excellent selection of siding material. Choose from our low-maintenance options including vinyl, fiber cement, aluminum, steel and authentic wood plank. Updating your home with a siding project can dramatically change the look and feel of your home. Offering a variety of different siding solutions, we have exactly what you’re looking for! Replacing your siding is a great way to update the look and structure of your home without major renovations. Griffith Exteriors offers vinyl siding and fiber cement Siding Services, both of which are beautiful, and virtually zero maintenance. Vinyl Siding is the most popular choice for homes in Montgomery and Bucks County PA. The attractive look and advanced material makes it the perfect solution for home exteriors! Choose from a variety of vinyl siding options and find the perfect solution for your home.